Chicago’s O’Hare International Airport has celebrated the official second phase opening of its $220m Northeast Cargo (NEC) development. City mayor Rahm Emanuel joined the Chicago Department of Aviation (CDA), project developers Aeroterm and cargo executives for the ceremony. The second phase of the project has opened ahead of schedule in “direct response to the strong demand for moving air cargo through Chicago,” said a spokesperson for the mayor. With O’Hare’s newest cargo development on track and ahead of schedule, 2017 air cargo volumes at the US cargo hub are already up by 15% over same period last year, putting Chicago on course to handle a record 1.8m tonnes by year end. “The City of Chicago is making investments and improvements to ensure O’Hare has not only the best commercial service, but the best cargo space,” said Mayor Emanuel. The NEC development, built at no cost to Chicago taxpayers, is funded by a $160m investment from Aeroterm and by more than $62m of airport funds. The 240,000 sq ft second phase building is home to Burak, Cargolux and Swissport tenant operators. When complete, it will be the largest airside cargo development built in the last decade at a US international gateway airport. Phase three is now expected to open in two to three years, also ahead of schedule. “There’s no better time to be investing in Chicago’s cargo operations, which is why Aeroterm is proud to partner with the City of Chicago as the developer of this major infrastructure project,” said Erin Gruver, chief development officer, Aeroterm. 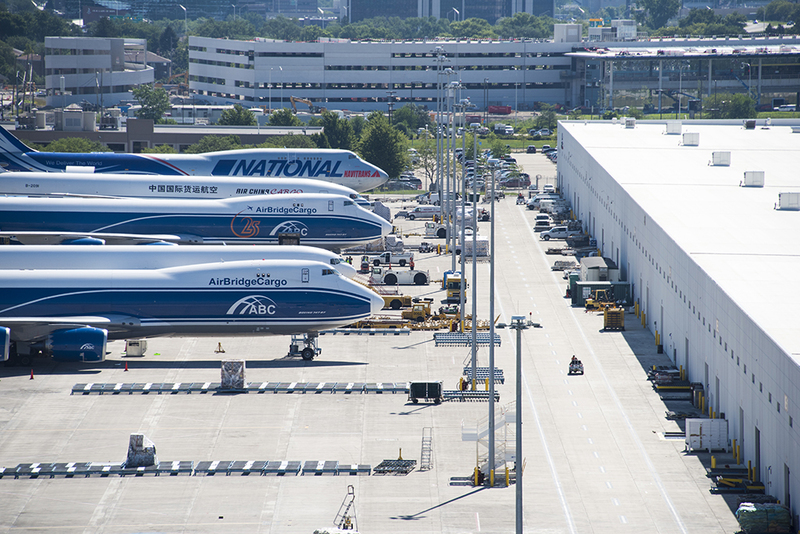 In its final form the northeast cargo development will deliver 800,000 sq ft of warehousing and apron pavement. These investments will make way for up to 15 widebody aircraft to unload at any given time at O’Hare, with each Boeing 747-8F type aircraft estimated to deliver cargo valued at $3m per call. Chicago city is also the venue for next month’s (September 25-27) Freighters World conference and newly launched freighter focused awards. Erin Gruver of Aeroterm features in the upcoming issue of Air Cargo News, while Chicago’s O’Hare airport is profiled in Freighters World, with both titles available for free digital download at the end of August to registered subscribers.